( Note: This text is taken from a printed history of the church and is reproduced "as is" to retain the context of its contents. ) It gives me great pleasure as the still relatively new vicar of St. Oswald's, Worleston to write the introduction to this booklet about St. Oswald's Church and its Patron Saint. It is something of a mystery, it would seem, why a South Cheshire Church should be dedicated to St. Oswald, a Northumbrian King. If the Church were more ancient there would I am sure be stories of how he may have camped on the site of the Church, perhaps on his fateful last journey to fight. The site of the Church it would seem though was given in a spirit of generosity rather than history. It is I feel not inappropriate that we think of generosity in the context of St. Oswald's Church and this booklet. 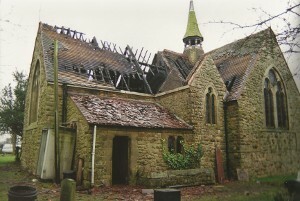 The proceeds of the sale of this book are going to the restoration of the Church following a tragic fire in December 1997, only a matter of days after a new Church roof had been dedicated, and it is published as we are about to reopen the Church for worship and mission in the communities that form Worleston Parish. This has been made possible because of the generosity of a large number of people both locally and from further afield, including the congregations of a number of other churches dedicated to St. Oswald. We rejoice therefore, not only to be part of the Worleston Community, but also the family of Churches dedicated to St. Oswald. The story of St. Oswald tells us that he did not avoid tragedy in his life, and it was his faith which strengthened him and the army who followed him to go forward. As he learnt his faith at the hands of the monks of lona, it is my prayer that because of the generosity of those who have given and worked so hard for the churches restoration, the communities of Worleston Parish in the future, will as they have in the past, learn of faith in God in this newly re-opened Church building, and from the family of faith who worship here. Thanks to all who have helped in the publication of this booklet, and especially to Geraldine Morgan-Wynne for all her time and effort put into its writing. The sentence of Consecration was read and promulged on Friday 25th of October 1872. It's chief signatory was the Lord Bishop of Chester. The parishes of Aston-Juxta-Mondrum, Poole, Cholmondeston and Worleston with a population of 365 were in need of an additional place of worship. Public subscription raised two thousand five hundred pounds along with aided grants from the Incorporated Society for the promotion of Churches arid Chapels arid also from the Chester Diocesan Church Building Society. The main property owners at that time were Baron Von Schroder of Rookery Hail, Frank Behrens of The Grange, Henry Tomkinson of Reaseheath Hall and Mr. F.R. Massey. The opening of the church was indebted to Baroness Schroder and Miss Alice Tollemache for all their efforts in raising substantial funds for the new church. The land for the church and school was a 'gift' from Henry Tomkinson of Reaseheath Hall. The Stone Laying Ceremony took place on Tuesday 19th of September, 1872 and it commenced with a procession of school children from Worleston along with the choirs of Acton and Worleston. The officiating clergy were the Rev. Canon Chater, Rev. R.S. Redfern of Acton and the Rev A. Warren. The choirs were conducted by a Miss Allen and the hymns sung were 'Christ is made the sure Foundation' and 'This stone of faith to thee we lay'. Before the foundation stone was laid, a glass bottle with parchment paper listing the name of the builder, architect and the giver of the land was placed inside. The vicar and the churchwardens placed one sovereign, one florin, one shilling, one sixpence and one threepenny bit inside the bottle. Miss Alice Tollemache then spread the mortar with a special commemorative trowel and laid the foundation stone. After the stone laying ceremony Baron and Baroness Schroder held 'Afternoon Tea' at Rookery Hall to celebrate the occasion. About four to five hundred people attended and were seated in various tents on the lawn. A cricket match was organised, there were races for the men arid lots of toys were made available for the children to play with. St. Oswald's Church was finally opened in the November of 1874. Present at the ceremony was the Lord Bishop of Chester, the Rev R.S. Redfern from Acton arid eleven other 'reverend gentlemen'. The church was crowded with many 'fashionable characters' arriving in carriages which stretched down the lane for a considerable distance. The opening hymn was '0 Thou in Whom thy Saints Adore' accompanied by Mr. Meredith on the harmonium. The text for the Bishop of Chester's sermon was Jude verses 20-21 and the collection raised eighteen pounds. The first service on the following Sunday was conducted by the Rev Redfem and a Miss Conway played the harmonium. The church was officially opened in November 1874. It took approximately two years to build and it was designed by C. Lynam of Stoke-on-Trent in Gothic style according to a Latin Cross Plan. The church is graceful yet simple and airy. A spire rises from the central crossing point and is supported by a rib vault. The roof is canted and celled. Externally the walls are of rough rubble blocks. Inside, the stones are dressed with tool marks visible. The plate tracery of the windows reflects architecture of the thirteenth century. The porch is situated on the south side of the church inviting entry via the rear of the nave. The open interior plan of the church was designed to accommodate the form of worship used in the late 19th Century enabling the congregation to see and participate more meaningfully in every aspect of worship. The choir is raised by one step above the nave and similarly the sanctuary is one step above the choir. Finely carved oak choir stalls were installed in 1907. A new organ case was made to accommodate the enlargement of the organ in 1927. A brass screen separates the nave from the choir and the altar rails guard the sanctuary where the High Altar of English Oak stands with four magnificent Riddel Posts standing in the focal position. These were set in place in 1926 along with a large wooden cross which is suspended from the roof in the chancel. In 1895 the chancel floor was relaid in mosaic and was a gift from John Hughes in memory of his wife Maria. The east window is by Kemp and portrays a crucifix with Mary and John in silver robes, St. Oswald crowned and in armour, a madonna and child and also St. Werburgh in blue. This window bears tribute to the memory of George Edward Lynch Cotton 1813-1866 a member of the Cotton-Jodrell family of Reaseheath Hall who had been headmaster of Marlborough School in the mid 1850's before he became Bishop of Calcutta in India. He was tragically drowned in the River Ganges in 1866. The priest's door on the south side of the chancel is of medieval origin. Inside the chancel are the sidilia where the officiating clergy are seated during the Eucharist and the piscina where the Eucharist vessels are washed. On the north side of the chancel is the vestry. The window in the north transept is by Morris and Co. and dedicated to Baron Von Schroder who died in 1912 depicting the Good Shepherd and St. Hubert with a stag. The window in the north wall of the nave was donated by A. and J. Done and set in place in 1920. The window in the south wall is dedicated to Captain Thomas De Avenant Cotton of the Royal Fusiliers who was mortally wounded in the battle of Nivelle in 1913 at the age of thirty and shows St. Oswald's victory at Heavenfield in c.634. On the east wall of the south transept there is a small window in memory of Emmie, wife of the Rev C.E.S. Davies who sadly died in childbirth in February 1919 followed by their son who died in April 1919. The window in the south transept depicts Noah, Abraham, David and Daniel. The west window features Hannah and Samuel on the left and St Elizabeth on the right and is in memory of Harriet Sofie Tomkinson. In 1997 the church had a major fire, which as you can see caused major damage. Following much effort the church was reopened and is now a bright and clean church well used by the local community. In the churchyard stands a memorial for those who fell in the two world wars. The most significant graves are those of Baron William Henry Von Schroder and Edward Cotton-Jodrell with his wife and son of two and a half months. OSWALD OF NORTHUMBRIA is a commanding figure. For eight years he was a successful warrior king and his most significant achievement was to bring Christianity to his people. He instigated the mission of St. Aidan to convert Northumbria and his reign saw the foundation of the monastery of Lindisfarne. Oswald was only thirty-seven years old when he was brutally killed in battle against the pagan king Penda, king of the Mercians at Maserfelth near Oswestry. Relics of his body were found in many locations - Bamburgh, Bardney Durham, Gloucester, Hexham, Lindisfarne, Oswestry and Peterborough. There were even as many as five 'St. Oswald's heads' claimed to be in existence - four in Europe and one interred with the remains of St. Cuthbert in Durham Cathedral which is generally accepted as the most authentic. In 616 Oswald was just eleven years old when his father King of Bernicia was killed by his mother's brother Edwin of Deira. Oswald with his companions - fled to Dal Riada in Western Scotland. It was here that he encountered Christianity and also learned the 'craft of war'. When Edwin was killed in 633, Oswald's older brother Eanfrith attempted to return to Northumbria but was killed by Cadwallon of Gwynedd. Oswald set out to avenge his brother's death and to reclaim his father's kingdom. With a small army and just before engaging in the Battle of Heavenfield, Oswald made a wooden cross hastily and placed it into the ground. He said to his soldiers 'Let us all kneel and jointly beseech the true and living God Almighty in His mercy to defend us from the fierce enemy'. Victory was his and Cadwallon was slain. Oswald had prayed to St. Columbia and his victory at Heavenfield was attributed to these prayers. He now had kingship of Bernicia and Deira. Oswald now turned to the missionaries of lona and Bishop Aidan came immediately at the new king's request. With the linguistic skills that Oswald developed during his time in exile, the king acted as an interpreter for Aidan translating Irish to English and soon the foundation of the monastery of Lindisfarne was established. The Venerable Bede also known as the 'Monk of Jarrow' was a biblical scholar and the first English historian. He believed Oswald was a hero. He saw him with many attributes - piety generosity kindness and humility Bede speaks of the King working in great harmony with Aidan. He tells a story of Oswald sitting at an Easter feast with Aidan. When the food was presented to the king he decided to have it distributed amongst the hungry and poor outside. The bishop blessed Oswald for his generosity and said "May this hand never wither with age". Nor did the hand wither with age for future events proved he was to meet a most violent death as a relatively young man. Oswald married the King of Wessex's daughter thus forming an alliance with another kingdom and he successfully persuaded his new wife's royal family to Christianity They had a son Oethelwald who failed to achieve royal power or leadership. It was to be Oswald's violent death that would eventually lead to him becoming a most popular king, martyr, and European Saint. Oswald could be presented as 'dying for the faith'. Certainly his conversion to Christianity was profound and even moments before his death he knelt and prayed for his soldiers. His last words were '0 God, be merciful to their souls'. Oswald died on the 5th August 642 at the hands of the pagan King Penda in Maserfelth. Penda ordered Oswald's body to be hacked to pieces and the head and aims affixed to stakes probably as some form of sacrificial offering which ultimately led to his martyrdom. A year later these were recovered by his younger brother Oswiu. Eventually the arms were enshrined in a silver reliquary at St. Peter's Church in Bamburgh where they were soon to be reputed the agents of miracles. The head remained in Lindisfarne until it was removed with the remains of St. Cuthbert to Durham in 995. This was carried out by the community of Lindisfarne when they fled to Durham in fear of a Viking invasion. Bede's account of Oswald's life and death is followed by five chapters of seven miracle stories of Oswald's relics. In fact his miracles dominate the first half of Bede's Ecclesiastical History and therefore play a significant role in the history recorded. Between 679-697 Oswald's niece Osthryth transferred other remains of Oswald's body to the royal monastery of Bardney The monks were reluctant at first to receive the bones as they felt that Oswald had imposed rule over them in the past but eventually they accepted the bones and enshrined them in a casket covered with King Oswald's royal banner of gold and purple. The water that was used to clean the bones became the source of many miracles. During the night of enshrinement a heavenly light appeared over the sky. The first recorded miracle was in Maserfelth, the place where Oswald died. A traveller's horse fell ill and laid down on the very spot where Oswald was slain, the horse was foaming at the mouth and was clearly dying, when suddenly it seemed to be no longer in pain and resumed to its feet. The man concluded that this was a place of great sanctity after which he remounted his horse and stopped at the first inn to rest. Here he found the landlords niece with palsy The man told the landlord the story of his horse and persuaded the girl's family to bring her to that spot which they agreed to do. She was laid down and told to rest for a short while. When she awoke she asked for some water, washed her face, got up and walked home on foot in good health. Someone else visited the same area and was overcome by the greenness of the land and felt that some holy person must have died there. He decided to take some soil wrapped in cloth in the hope that it might cure illnesses. That same night he was invited to a neighbour's house where he placed the soil on a large beam. Everyone sat down to supper but later that evening a great spark came from the fire and in no time the house was ablaze. The guests ran out but the house was consequently burned down except for the beam to which the soil was attached. Another miracle concerned a young boy who suffered with epilepsy He was told to visit the tomb of Oswald and to stay there quietly until a monk came to collect him. When the monk collected the boy it was obvious that he had been cured. With so many miracles reported it was inevitable that Oswald was destined to become a saint. As for the other 'four heads' claimed to be in Europe they may well be fragments from Oswald's skull. Those countries claiming possession of the head are Zug and Schaffhausen in Switzerland, Childes in Germany Utrecht in Holland and Echternack in Luxembourg. In 1827 Canon Raine of Durham Cathedral, a man obsessed with the life of St. Cuthbert, opened Cuthbert's tomb and showed very little interest in the fact that another skull was present with Cuthbert's remains. Fortunately the tomb was reopened in 1899 when further examination of the 'other skull' was carried out by a highly competent doctor who concluded that the skull was probably Oswald as it showed a weapon cut. When Cuthbert's remains and the accompanying skeletal material were re-interred the new coffin lid was carved with two symbols; one the cross of St. Cuthbert and the other a crown to indicate the presence of Oswald. Interestingly St. Oswald's Church in Durham carved a raven and ring on its new organ case in the early 1990's. The raven is believed to be continental in origin. 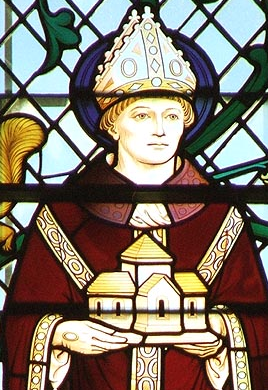 It is generally agreed that Oswald could be portrayed as the founder of the Northumbrian church, patron of foreign Christians and crusader. He was a king who died leading his people into battle for a 'just' cause. Oswald is often depicted with the following symbols: A wooden cross associated with his victory at Heavenfield and which was said to have had miraculous properties. The silver dish representing his generosity to the poor and hungry at the Easter Feast Day The crown and orb showing his royalty and commitment to Christianity A raven with a ring referring to his marriage to a Wessex princess. The story of Oswald's life and cult created great interest in Britain but his popularity in Europe was prolific and subsequently became the source of many fascinating legends.